AZCentral posted a review of Avenged Sevenfold concert in Phoenix, AZ. The best act of Mayhem Festival was hands down Avenged Sevenfold. The band rightfully earned its place as a headliner—A7X's set was everything a fan would expect out of a metal show. There were theatrics and fire, but most importantly, a lead singer who commanded the crowd's attention. The guitarists were entertaining to watch, but M. Shadows was a sight to see. The singer was constantly in motion, pacing between the onstage risers against a backdrop of a gothic cathedral and pyrotechnics to boot. The crowd was energetic to begin with, thanks to all that free Rockstar, but erupted during A7X's breakout single, "Bat Country." The intensity mounted with "Hail to the King," as guitar riffs sounded in time to fire balls and a large skeleton brandishing a sword was revealed in the background. The bulk of Avenged Sevenfold's set was metal on par with Metallica, but the show wasn't all about heavy rock and stage effects. Power ballad "Seize the Day" wad dedicated to the late James "The Rev" Sullivan. 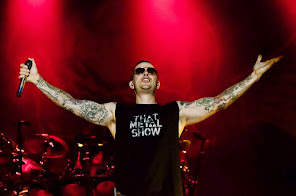 M. Shadows urged the fans to raise their cellphones and lighters to honor the loved ones they've lost. The song ended on a high note, as Shadows said, "Remember, it's a good f—-ing night!" Many bands at Mayhem Festival complained about the heat, but Avenged Sevenfold took a different approach. M. Shadows did not state the obvious. He told fans we were lucky to live here. He lauded KUPD and explained that rock stations are dying out around the country, imploring the audience to fight for rock radio with the song "This Means War."